I suspect that Burnt at the Steak will be one of the most talked-about shows at the Fringe. 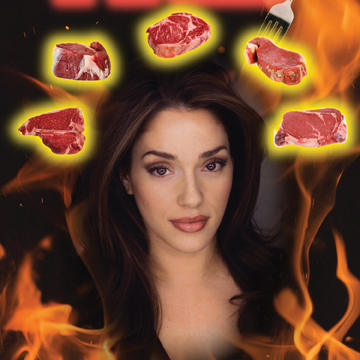 Carolann Valentino delivers a brilliant and bombastic performance in the story of a New York-born Italian who is raised in Texas and returns to Manhattan to make a career in acting – and in the meantime, managing a high-end steakhouse. Playing more characters than you could shake a skewer at, Valentino’s charm and talent fill up the (rather large) room at Performance Works. She switches effortlessly between meaty roles as a beefy and raw maitre d’, a sauced customer, her meatball cooking mama and herself singing and acting in a way that is paradoxically rare and well done. It’s a musical-comedy tour de force, delivered with style and sizzle. And… I’m all out of meat-related adjectives. See the show. You’ll get more value and enjoyment out of this show than from a $150 steak.